Bark and leaf of black walnut. Thousand cankers disease is a fungal disease of walnuts (Juglans spp.) that is carried from tree to tree by a small bark beetle called the walnut twig beetle (Pityophthorus juglandis). It has killed countless ornamental black walnut trees in the western U.S. and was found for the first time in the eastern U.S. in 2010. 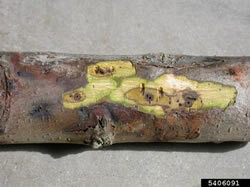 The association of the walnut twig beetle with the fungus that causes thousand cankers disease is a recent discovery. While researchers have known of the beetle's existence for some time, the fungus was only recently discovered. It has since been identified as a new species, fittingly named Geosmithia morbida. Cankers of thousand cankers disease revealed just under the outer bark of a walnut. When an adult walnut twig beetle bores into the bark of a walnut tree to lay its eggs it also infects the tree with the pathogen that causes thousand cankers disease. At the sites of infection, small lesions, or cankers, form just under the outer bark. The beetles within the tree also emit pheromones, chemical signals that summon other walnut twig beetles to the tree. For each beetle that bores into the bark, another small canker is formed, eventually covering the branches and trunk of the walnut. As more cankers are formed, they merge and limit the ability of the tree to transport and store nutrients, slowly resulting in tree death. In North Carolina, both black walnut and butternut are susceptible to the disease. Currently, butternut is also suffering extensive mortality from butternut canker, another disease not native to the eastern U.S.
All black walnut trees appear to be susceptible to the disease; there is not yet any documented resistance. Other walnut (Juglans) species native to the western U.S. may also be susceptible. Many insects and pathogens are host specific; in other words, they only attack specific species or genus of trees. That's why you won't see a pine bark beetle attacking an oak tree. Pecan and hickory species, while closely related to the walnuts, are not susceptible to thousand cankers disease. The beetle is native to the southwestern U.S. and Mexico. Geosmithia morbida is suspected to be from the same region. Where is the disease currently found? The first recorded incident of thousand cankers disease in North Carolina (Haywood County) was confirmed in late fall, 2012. Thousand cankers disease was not found east of the Mississippi until 2010, when it was discovered in Knoxville, TN. More recently, the disease was found near Richmond, VA (2011), in Bucks County, PA (2011), near Fairfax, VA (2012), and in six additional Tennessee counties. Thousand cankers disease is currently found in Arizona, California, Colorado, Idaho, Nevada, New Mexico, Oregon, Pennsylvania, Tennessee, Utah, Virginia, and Washington, and now North Carolina. How many trees have died already? In the western U.S., where black walnut is planted for nut crops and ornamentals, there has been extensive mortality in the last decade. In Colorado, several cities report that black walnut has been completely eliminated from the landscape. The impact of losing black walnut in its native range (the East and Midwest) is unknown. Will it cause black walnuts to go extinct? It is too early to tell. Some researchers think that they may all be lost while others are not sure. Regardless, research to control the disease is ongoing and the best management plan for now is to minimize its spread while a permanent solution is sought. Why is black walnut important? Black walnut is a valuable resource to humans for its nuts, high quality wood, and as an ornamental landscape tree. It is also important to wildlife. Its nuts serve as food for birds, squirrels, and other small mammals. The best estimate is that a tree will die 2 to 3 years after the first symptoms occur. It is likely that at that point the tree has already been infested for several years. In the West, it may take a decade or more to kill a tree. Once a tree begins to decline from thousand cankers disease it will not recover. Advances in research may change this, but for now there is no therapeutic cure. Thinning crown and branch dieback. What does a tree affected by thousand cankers disease look like? At first, one may notice a thinning tree top, discolored or smaller than usual leaves, and/or individual branches dying. All of these symptoms occur in the summer months (June-August) when beetle activity is highest. Branches sprouting from the tree trunk are also common. On close inspection, small holes where the beetles have entered and exited the bark may be seen and if a very thin layer of the bark is removed or scraped, small oval or round cankers may be seen. Cankers are dark brown and less than an inch across (about the size of a quarter). Walnut twig beetles are dark brown and very small - less than 1/16 inch in length. Adult beetles begin to emerge in late April but are most common late July through late August. The walnut twig beetle, like other bark beetles, bores into the bark of its host tree, lays eggs, and feeds on the nutrient transportation tissues of the tree. Infected walnut trees should be destroyed or salvaged. Currently, the tree care community does not know how to protect or save trees from thousand cankers disease. Keeping trees as healthy as possible through good forest and ornamental tree management practices might delay infestation and/or disease development. The best thing to do is to quickly detect its presence in new areas and destroy affected tree materials. If you have several walnut trees, remove all dead and dying infected walnut trees from your property and dispose of the wood properly to reduce the chance of having other trees attacked. Properly dispose of material from affected trees by burning or burying branches and smaller diameter wood as soon as possible. If wood is kept to be milled or used in woodworking projects it must be debarked and waste bark should be burned or buried. The primary focus right now is to prevent further spread of this disease, especially spread facilitated by humans. Transporting woody materials from dead or green affected trees to a new location can spread the insect and fungus to new areas. Don't move firewood or other unprocessed walnut wood products out of areas where thousand cankers disease has been detected or is suspected to be present. Use locally grown firewood or wood that has been heat treated and inspected. How can moving firewood and other wood products spread the disease? The walnut twig beetle is very small and difficult to detect. The cankers caused by the fungus can also be tricky to find since they are confined to a very thin layer below the outer bark. Even with a trained eye signs of the both the beetles and the pathogen can be easily missed. Any twig beetles living in the bark of wood can emerge during transport or at the final destination and attack new trees and spread the disease to its new location. With thousand cankers disease found in North Carolina, should landowners cut down and market all of their valuable walnut timber now? Natural spread of thousand cankers disease is thought to be slow. If someone is growing walnut timber on their property, they should monitor their trees for disease symptoms. As long as trees are healthy and growing, and not under imminent threat from the disease, they should continue to be managed according to a forest management plan. 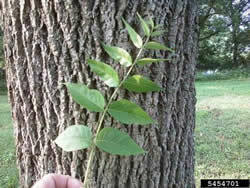 If walnut trees are found to be infected a salvage harvest may be an option. The walnut twig beetle and the fungus are found only in the bark, and possibly on the edge of the live wood, so timber quality will not be affected directly by the insect or pathogen. How can one find out how much walnut trees on his or her property are worth? In a forest setting, a consulting forester who is registered in North Carolina can appraise the value and help with the marketing of your timber. Some consulting foresters work in urban areas and may be helpful in assessing yard trees. For yard trees, assessing a value may be difficult. Landscape trees usually have more limbs and poorer form than those in a forest. They may also be damaged by lawnmowers, cars, nails and other urban stresses. Yard trees can also be expensive to remove due to nearby houses, roads, utilities, and other hazards. The cost of removing a tree may equal or exceed its value. As long as they are healthy, urban trees' highest value are usually as shade trees. A consulting arborist may help you assess the value of urban walnut trees or recommend a buyer who will give you a fair assessment. Why is there quarantine for thousand cankers disease? After the pathogen was found in the state for the first time an evaluation determined that it is in the best interest of the state and its walnut resources to try to confine the infected area to as small an area as possible. 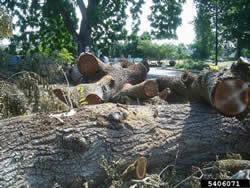 Movement of walnut plants and plant parts including firewood, logs, stumps, roots, branches, and composted and uncomposted chips can quickly spread the walnut twig beetle and the fungus that causes the disease to new areas of the state. Can a landowner harvest walnut timber or firewood in a quarantined area? Walnut trees can be harvested in a quarantined area as long all parts of the tree (except nuts, nut meat and hulls) stay within the quarantined area. That means harvested materials can only be left on site or transported to locations inside of the quarantined boundaries. This applies to both diseased and healthy trees. Harvested walnut wood can freely move from a non-quarantined area into the quarantine boundaries. Can walnut wood ever be moved out of a quarantined area? Only wood that has been has been processed into lumber (100% bark-free, kiln dried and with square edges) or finished wood products without bark, including walnut furniture, instruments, and gun stocks, can be moved out of a quarantined area. Who should one contact with questions about quarantines and moving walnut wood products? In North Carolina, contact Plant Industry Division Plant Pest Administrator Phillip Wilson at 919-707-3753 for information about plant quarantines and regulations. 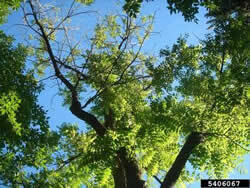 What should one do if he or she observes a dying walnut tree and suspects thousand cankers disease? Please report the location and descriptions of potentially positive trees to1-800-206-9333 or newpest@ncagr.gov. Contact your N.C. Forest Service county ranger for diagnosis assistance and management advice. Local rangers will refer potentially infected trees to Forest Health or Plant Industry Specialists. DO NOT COLLECT SAMPLES! SAMPLES SHOULD ONLY BE COLLECTED AND TRANSPORTED BY TRAINED PERSONNEL!